Keeping with last week’s frantic pace, the second episode of Top Chef: New Orleans didn’t give the 18 remaining cheftestants a chance to slow down and have a Sazerac. Instead, Padma sprung a Quickfire Challenge on them: gumbo. After pulling all-nighters to make the classic New Orleans dish, the cheftestants offered their gumbos up to be judged by the Queen of Creole Cuisine, Leah Chase. The NOLA food celebrities didn’t stop there. F&W Best New Chef 1989 Susan Spicer dropped by to guest judge this week’s Elimination Challenge. Padma divided the chefs into four teams, and tasked them with running a food truck to feed Habitat for Humanity volunteers still working to repair damage from Hurricane Katrina. Team challenges can bring out the best and worst in chefs and this one was no exception. 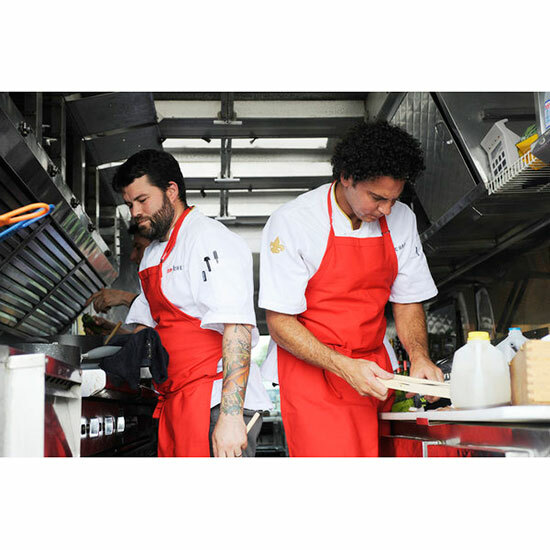 For some teams, egos clashed and chefs panicked; others ran their operations as smoothly as a well-tuned food truck. For those playing F&W’s Fantasy Top Chef, here are the points earned and lost by chefs last night. Carrie Mashaney: +5 for her green Trinidadian-style gumbo winning the Quickfire Challenge. +1 for using a giant, chilled wine bottle to roll out empanada dough. +10 for winning the elimination challenge with her perfectly flaky empanada dough. Total points: 37. Shirley Chung: +2 for her pork belly gumbo being in the top of the Quickfire Challenge. Total points: 25. Aaron Cuschieri: +2 for his hot-and-sour gumbo being in the top of the Quickfire Challenge. +3 or being on the winning team in the Elimination Challenge. Total points: 23. Michael Sichel: -2 for his being in the bottom of the Quickfire Challenge for his 1:30 a.m. decision to dump his original gumbo and instead make a “drunken chicken gumbo.” +1 for throwing a crawfish boil for the other chefs. Total points: 20. Travis Masar: +3 for being on the winning team in the Elimination Challenge. Total points: 19. Carlos Gaytan: +3 for being on the winning team in the Elimination Challenge. Total points: 18. Brian Huskey: +3 for being on the winning team (and making ceviche ice cold, just like Tom likes it) in the Elimination Challenge. Total points: 18. Louis Maldonado: +1 for his “dreamy smile” earning him the spot of spokesman for the green team. +1 his smart decision to serve chilled watermelon amuses on a hot New Orleans day. Total points: 17. Nicholas Elmi: -3 for being on the losing team in the Elimination Challenge. Total points: 17. Janine Booth: +2 for coming up with something called a White Bloody Mary, which we still don’t know any details about but really want to try. Total points: 16. Bret Pelaggi: -3 for being on the losing team (and making lukewarm ceviche) in the Elimination Challenge. Total points: 10. Patricia Vega: -2 for being in the bottom of the Quickfire Challenge for her muddled mofongo gumbo. -3 or being on the losing team in the Elimination Challenge (and using terrible tomatoes). Total points: 4. Jason Cichonski: -10 for being told to pack his knives and go for his soggy, pre-made salmon hand rolls. Total points: 4. Here are the remaining chefs whose points did not change this episode: Sarah Johannes (28), Nina Compton (27), Justin Devillier (19), Stephanie Cmar (19), Benedetto Bartolotta (16). Congratulations to the Carrie Mashaney supporters! Your chef is currently in the lead with 37 points. For those who drafted Cichonski, it’s time to redraft a free chef using F&W’s updated roster.